Packard Bell celebrated the launch of its latest range of laptops and peripherals in Milan this week, with the company hosting its first summer party. In a keynote which was filled with optimism about the PC industry – Packard Bell is currently second in the market for mobile computing – the company revealed its inspiration for its latest range: mobile phones. "The way you can personalise your handset – that is a big thing for us." The mobile phone industry is a burgeoning one at the moment, with apps being one of the main popularity drivers. Packard Bell is trying to lock on to the instant connectivity of applications by adding one-touch social networking access to its dot a, dot u and dot s notebook ranges and also its Butterfly S and EasyNote X range. Style also seems to be a main factor with Packard Bell's 2010 summer line-up dot a and dot u computers are for the "style conscious" while the dot s is being classed as "avante garde". This is all part of Packard Bell's rebranding which began back in 2008 – something which seems to have worked when it comes to the all important numbers. "Only a few years after we announced a refresh of the brand, we are now number two in the PC market and number one in the mobile PC market," notes Packard Bell product manager Gianpiero Morbello. "We want to keep this up, we don't want to lose pace with the opposition – we want to be number one in the PC market." Fromont agrees, noting: "In 2008, we were acquired by Acer and were at the time selling 1 million PCs a year. "In the first half of 2010, we have sold 2 million PCs already. That's just in the first six months of the year, so we are going to sail past the four million mark." Packard Bell has always been seen as an entry level brand and although this hasn't changed, it is beginning to pack some power into its PCs. This is most notable in the Butterfly S and EasyNote X range. Both of these ranges have the Core i7 chips inside and will be one of the affordable laptops housing this processor. Even though Packard Bell has gone through a rebranding, it is still has some way off persuading the masses that it can be both desirable and functional, something Fromont agrees with: "People like Packard Bell because they like the look of the products and understand the brand. They don't buy because of processing power – even though the products have the power, that's not part of their purchasing decision. "We are not the coolest or the hottest brand on the planet but we are getting there." 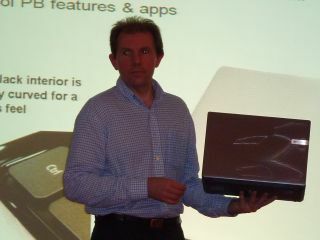 Packard Bell's summer range comprising the OneTwo DTX, Dot s, u and a, EasyNote Butterfly S and EasyNote X has a UK release date of August.